After a long hiatus from having a baby and moving upstate NY, I'm back and everything is ON SALE! During this period, all in-stock items will be shipped in about 1 week, and custom made orders will be processed on a case-by-case basis until the store is fully functional. I appreciate your patience with me. Convos will be answered within 24-48 hours. Photograph of Molly McCoy provided by Angela Cox Photography. Full Wreath Rose Ring, 14K rose gold plated, handmade in NY. Ready to ship. Gold/sterling silver options available. Earrings available. 14K Rose Gold Full Wreath Rose Ring, size 7.75 ready to ship. Sample sale price. Other sizes and metal options available for estimate. Rose Adjustable Ring, sterling silver, handmade in NY, ready to ship. Gold/rose gold plated finishes available. Earrings/Necklace available. Rose Bib Collar Necklace, 14K Gold Plated/Sterling Silver, handmade in NY. Ready to ship. 16" Statement/Bridal jewelry. Great gift for her. Full Wreath Rose Pendant Necklace, 16-17 inches long, gold/rose gold plated. Ready to ship. Sterling silver available. Great gift for her. 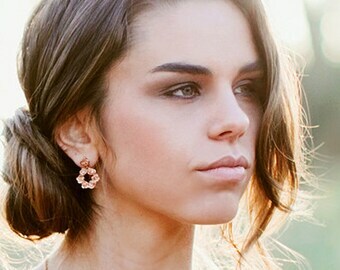 3-Rose floral stud earrings, wear it 2-ways, handmade in NY, sterling silver. Ready to ship. Gold/pink colors available. Gift for her. Rose Wreath Dangle Earrings, handmade in NY, 14K gold/rose gold plated. Ready to ship. Sterling silver also available. Great gift for her. Beautiful design and an unusual piece. It makes a subtle statement and is great to wear dressed up or dressed down. Lovely packaging and Deb was incredibly helpful regarding shipping advice. My Fashion's Night Out trunk show at Henri Bendel. My name is Debbie Liu, I am the designer and the owner of Harlequin&Lionhead. The brand was created one day in 2010 when I was still working in advertising. I was at a meeting. The trees and wind outside was calling out to me and I drifted into a daydream of being a happy critter. My two rabbits, Toffee (a harlequin) and Charcoal (a lionhead), were such delicate and comlex animals sometimes I would wonder what was going on in their little heads and behind those beautiful and expressive eyes. That was why I named my shop "Harlequin&Lionhead." I always know I want to create jewelry that would inspire imagination to others, and put a smile on their faces wherever they are. A city girl all my life, the nature is always fascinating to me. I draw my inspiration from fairies and forest life, mysterious oceans and colorful sealife. I strive to preserve the transient and fragile beauty around us in everlasting sculptural forms. My jewelry is always a combination of the gentle and the wild. They are romantic with an elegant but rustic sensibility. I sculpt in wax or clay and transform them into metal. All jewelry pieces are handcrafted in US. Currently Harlequin&Lionhead jewelry is sold exclusively online. I am open to custom orders. Just email me at harlequinlionhead [!at] gmail.com, or convo me at Etsy and I will get back to you as soon as possible. Debbie Liu is an ad agency veteren turned jewelry designer. Specializes in carved wax fashion jewelry, her favourite material is sterling silver. Her favourite creatures are her bunnies, which inspired the name of the brand, Harlequin and Lionhead. If you are familiar with rabbits, you would probably notice that Harlequin and Lionhead are 2 specific rabbit breeds. Yes, they are the breeds of my 2 babies, Toffee and Charcoal. I love rabbits and the nature. It is evident in my works. I sculpt to bring metals to life through various metalsmithing processes at a New York studio. Below are some key things to note when ordering my jewelry. If you have any question, please do not hesitate to email me at harlequinlionhead [!at] gmail.com or convo me here with Etsy conversation tool. Any customized products cannot be exchanged or refund, unless I did not follow your instructions correctly or unless it is damaged during transit, in which case a repair may be possible on a case by case basis. I pack my items safely but should it get damaged during transit, I can arrange with you for an exchange if the item is still in stock, or if it is a custom piece that can be repaired. Please convo me prior to shipping anything back. For ready to wear item, if you are not satisfied for any reason, please convo me with your concern and let's work on a solution together. When your return package arrives safely with no damage I will issue a refund or exchange, based on your request. As a small business, I cannot afford to offer free exchange and return unfortunately. But we can split the shipping cost. You pay for the return shipping and I pay for shipping the replacement. I cannot be responsible for lost return package so please send it back with tracking or insurance. Please kindly pack the return in the safest possible way. It will be headache for both of us if your item is returned damaged during transit. I appreciate your kind cooperation. Relevant sales tax is included at checkout. I ship local or international with USPS but if you prefer a more secured shipping method, I can also ship with UPS. Please convo me for an estimate. For all items over $150, shipping charges includes costs for priority mail direct delivery, adult signature required and insurance. If you would like to use the minimum first class services and that's not an option available in my listing, feel free to contact me and I can change that for you. If you choose first class shipping, I am NOT responsible for any lost or damage during shipping. With USPS priority shipping service, you will be provided with a tracking number. I pack my items safely but should it get damaged during transit, I can arrange with you for an exchange if the item is still in stock. As a small business, I cannot afford to offer free exchange and return unfortunately. But we can split the shipping cost. You pay for the return shipping and I pay for shipping the replacement. For international customers, however, tracking number may not be useful for tracking the package in your country. Therefore for any item over US$150 I would suggest upgrading to UPS. If you decide to stay with USPS priority shipping, I will not be responsible for lost package after the item leaves the US. All custom orders will be shipped with either USPS priority service or UPS. Estimate for shipping cost will be provided prior to project commencement. Any international customs incurred will be covered by the customer. Currently most pieces are in stock and will take about 1-2 weeks to process until store is fully functional. If you have any question, please do not hesitate to email me at harlequinlionhead [!at] gmail.com or convo me here with Etsy conversation tool.